EXPLORE. CREATE. STAY OUT LATE. The beginning of every month starts with a bang in downtown Dayton. First Friday is a free event held from 5 to 10 p.m. at several locations throughout downtown. This art hop features exhibit openings at the galleries, along with a variety of entertainment options, including street performances and roaming entertainers, arts demonstrations, live music, dining and shopping specials, and more. Dozens of locations participate in this event, which every month offers something new and surprising. Add to all this everything going on at the restaurants, bars, nightclubs, theaters, comedy club, movie theater and more that make up the downtown mix. Click the button above to find detailed information about specific happenings during the upcoming First Friday. First Friday often is looking for performing artists to provide roving entertainment on downtown streets during First Friday art hops. If you are interested in participating, please contact Emilee Valken at (937) 224-1518, ext. 227. 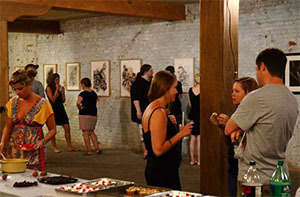 First Friday is presented by the Downtown Dayton Partnership with support from Rev. Cool’s “Around the Fringe” show on WYSO-FM 91.3 Public Radio, the Oregon District Business Association and the Ohio Arts Council.